Down facing bell shades for brighter light below where needed. Shades are made of halophane type glass to resist breakage. Includes 6 feet of chain for height adjustments. Use with (3) Medium, Type A, E-26 - E-27 bulb(s) - 60 watt max. Bulbs sold separately. Ranch style indoor fixture pairs well with rustic dicor. Indoor light fixture includes hardware, installation instructions, and 6 foot chain for hanging adjustments. Fixture attaches to matching decorative ceiling plate and is suitable for vaulted ceilings. Bright brushed nickel finish with crisp alabaster glass for a fine contemporary style. Adjustable height single tier chandelier includes 6 foot chain for height adjustment. Fixture attaches to matching decorative ceiling plate and is suitable for vaulted ceilings. Swooped sconce arms and white frosted glass bell shades. Indoor light fixture includes hardware, installation instructions, and 8 foot chain for hanging adjustments. Fixture attaches to matching decorative ceiling plate and is suitable for vaulted ceilings. Nickel 3 Down Kitchen Chandelier Down facing bell shades for brighter light below where needed. Shades are made of halophane type glass to resist breakage. Includes 6 feet of chain for height adjustments. 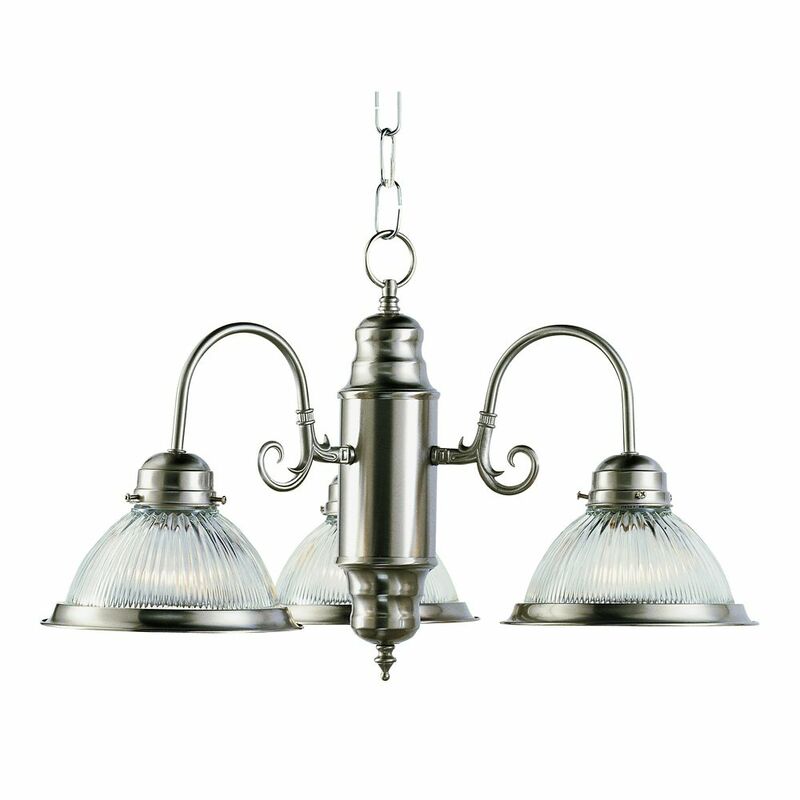 Nickel 3 Down Kitchen Chandelier is rated 2.6 out of 5 by 5. Rated 2 out of 5 by Jim from When it was received the package was missing parts. Took back to store for return and exchange. When it was received the package was missing parts. Took back to store for return and exchange. Rated 1 out of 5 by Calico from Poor quality. Bubbles in the glass shades. Poor installation instructions, although we have som... Poor quality. Bubbles in the glass shades. Poor installation instructions, although we have some experience. Cannot get chandelier to hang straight in spite of various attempted solutions. Not worth the $. Rated 3 out of 5 by Hadood from Shipping container was open at pick up. Lamp arms were not uniform in shape (bent). Result is pr... Shipping container was open at pick up. Lamp arms were not uniform in shape (bent). Result is product that never hangs in a true vertical position because it is out of balance. I accepted because I had no confidence an exchange would be any better. It meets my needs but is not a particularly good item. Rated 3 out of 5 by jasvanek from I was very disappointed with the condition my light was in when I received it. None of the arms w... I was very disappointed with the condition my light was in when I received it. None of the arms were straight or level. Same was true for the globe/bulb holders. The main body was askew and had to be taken apart and everything realigned. Three of the shade retaining screws were missing. I was actually rather surprised at this due to the massive amount of packing foam in the packing box. Once you correct all of the manufacturing/assembly/packing issues the fixture is rather nice. I could understand if it was a no-name bargain item, but a I was surprised that someone, somewhere allowed this item to pass inspection. If you don't mind putting in extra time and effort it might be worth it. But I know there are similar products that don't require rebuilding out of the box. Rated 4 out of 5 by Cherty from Blend of modern and old This chandelier fit well in my 1940s home, and the brushed nickel finish made it look fresh and modern. The center part was assembled crookedly and when it's in your hands you can tell that it's kinda cheap, but when it's hanging it's stylish and it looks heavier than it is. It's a good deal for the money.